It’s not much of a surprise Miquel Cotto was victorious over Sergio “Maravilla” Martinez. After all, the experts openly expressed their concerns over Martinez’ fourteen month absence from the ring. They were concerned about Sergio’s troublesome knee and shoulder injuries, plus a broken hand? His body seemed to be breaking down. Despite Sergio’s assurances, many experts doubted whether he could come back and regain his previously superb condition and superior abilities? We now know they were right. However, even Cotto and Freddie Roach had to have been surprised by how easy it was for Cotto to get Sergio on queer street. 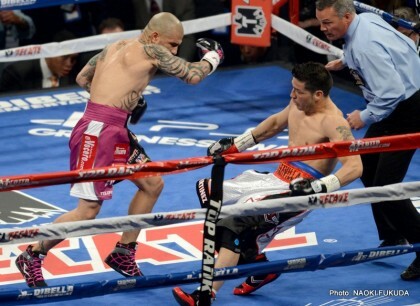 For pete’s sake, Sergio was wobbled with Cotto’s first left hook! It was baffling? What a predicament Sergio was in! The opening bell had barely stopped ringing! This lineal world middleweight champion from Argentina had never been in such a dilemma. His first reaction had to be to run away, escape; but his legs wouldn’t cooperate. The right knee seemed to be locking up on him. Two more times, in the first round, he went down. You could see panic on his face. Again, he tried to vamoose, to make a run for it; but he was trapped, feeling exploited by a fighter he felt sure he could beat. On the other hand, Sergio was confused. He had been totally convinced he could beat Cotto, and then Cotto’s 1st damn punch put him in deep doo doo. Sergio’s fans didn’t get it. Many times he had been hit harder. He’d always been able to fight off the effects and escape, which was what he was trying to do Saturday night in front of a capacity crowd at Madison Square Garden. It wasn’t to be. Instead, Freddie Roach’s words started to ring true. In the pre-fight build up, Freddie started building a case for yet another trainer of the year award. This six time BWAA trainer of the year had told the media that Sergio wasn’t a very good boxer. What? To some that sounded awfully strange. How could he say that about one of boxing’s best P4P fighters? How could a fighter, such as Sergio, reach such heights, unless he was a good boxer? Freddie explained. He said Sergio’s ability rested in his athleticism, his superior hand and foot speed, his elusiveness. Similar criticisms had been leveled at Muhammad Ali. His early detractors pointed out that he held his hands too low, and moved straight back. They expected those flaws would get him defeated. Sergio, not unlike Ali, also proved the critics wrong as he defeated one opponent after another. When Ali’s unbelievable reflexes and speed began to desert him, he became less elusive, and started to get tagged. Unfortunately for him, he found out he could take a punch, and the rope a dope was born! Unfortunately, (maybe fortunately) for Sergio, he doesn’t possess that kind of chin. Over the past few years, he has kissed the canvas. When his legs failed him, just like Ali, he didn’t have technical skills to fall back on like Floyd Mayweather, Jr. or Bernard Hopkins. The great technicians can weather more of those adverse conditions. It’s then they are able to demonstrate their mastery of the pugilistic science. They slip, parry, block and tie up their opponent, plus a multitude of other tricks, that make their opponents feel frustrated, and inadequate. There was none of that with Sergio. In fact, Cotto must have felt euphoric with his good fortune. Here was Sergio, seemingly a patsy, right in front of him, someone who couldn’t move, and someone who had few of the technician’s skills. Yes, Sergio, it’s time to hang them up. You’ve been a great world champion, one of the best P4P fighters in the world. Hold your head up and be thankful you can move on to the next stage of your life, still healthy and happy that you’ve done enough to guarantee your place in boxing history. Adios.